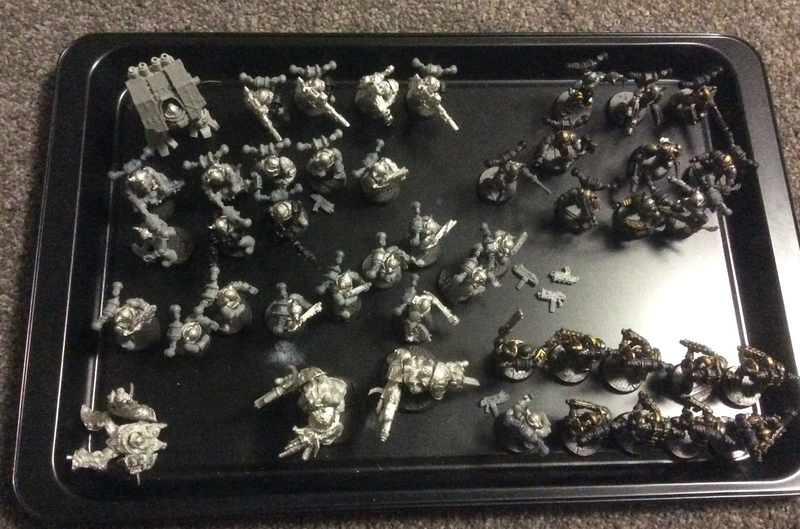 Over the last few evenings I've been working - as I have had time - to get my Iron Warriors project of 2004 ready for painting. Pre-GTBC, the Iron Warriors were a proud Legion with rules penned by the great Pete Haines (author of the greatest of all codex). When nine became an afterthought of one, the project got shelved. Despite a few attempts at resurrection, there was no appetite here for the game. Well, this latest attempt has seen an army completed and ready for spraying. I have one fully painted unit, one partly painted unit, an unpainted unit and a unit of Havocs with a choice of heavy weapons (either 3 Heavy Bolters + Autocannon or 3 Lascannons + Missile Launcher). In addition, I have a Mark IV Dreadnaught with Seige Drill and either Lascannon or Autocannon and a unit of three Obiterators. Three Rhinos have been painted up already and I have purchased a Warpsmith and a Forgefiend. All the infantry have Iron Warriors heads and bodies and I have mixed in some Iron Hands bionics. I'm short one CSM backpack but I'm sure I'll pick that up in next week or so. So this is my next army painting project with a view to sitting them on a shelf so they can reminisce with my two Death Guard, one Emperor's Children and Jack's World Eaters about the good old days. And last week I found a unit of converted EC Nouse Marine bikers that must be done. You see I thought of that and dismissed it. I then decided to adopt the "heroic" stance where it becomes "greatest of all codex" like "greatest of all axe"
Ha ha syntax error! Nice save though!